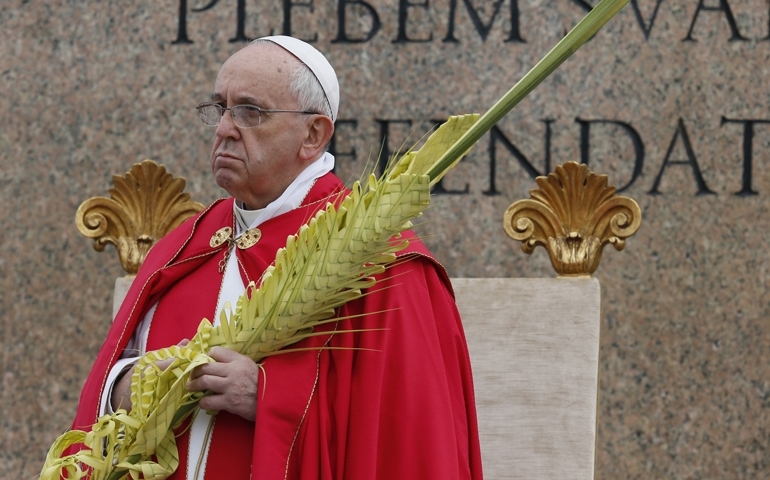 VATICAN CITY Preceded by young people and clergy waving tall palm branches, Pope Francis began his Holy Week liturgies by encouraging people to ask themselves which personality in the Gospel accounts of Jesus passion, death and resurrection they resemble most.”Where is my heart? Which of these people do I resemble most?” Pope Francis asked Sunday as he celebrated the Palm Sunday Mass of the Lords Passion. via Pope: During Holy Week, ask which Gospel character you resemble | National Catholic Reporter. Pope Francis was inviting us to enter into an Ignatian style of prayerful imagining. In the Passion story, who do you most identify with? For me, my heart, mind and gut are united with Mary. My grand-daughter doesn’t like it when I call her my grand-baby. At the ripe age of 2 1/2, it insults her sense of maturity in relation to her one year old brother. I tried to explain to her that her daddy is still MY baby. “No, Grammy”, she argued. “Daddy’s not a baby!” It was useless trying to explain to her that the strapping young man who is now a wonderful husband and father will always be my baby boy. One of the most glorious gifts of parenthood is rejoicing in all the accomplishments of our children, from first steps to graduations to careers to parenthood and beyond. One of the hardest aspects of parenthood is suffering with them through the many struggles of life. As wee babies they stole your hearts and never gave them back. Their pain became your pain, and continues to be. I resist pondering Mary’s agony as her son was tried, tortured, humiliated and finally put to a gruesome death. It is too much to bear. This was her baby boy, now grown and trying to fulfill God’s will in his life. How did Mary find the courage to stay beside him, to remain standing even at the foot of the cross when others had fled? How does a parent survive the breaking of their own heart when they see their child suffer so? Pope Francis, in his wisdom, knows that nudging us to enter into the gospel with our mind and heart can touch us more personally than soaring theological treatises or lengthy sermons. This is a powerful, yet simple exercise. What about you? Who do you identify with in the Passion readings? Thank you for this reminder, Isabella. I have been feeling “spiritually dry” this Lenten season and going into the Tridium. Your reminder of Pope Francis to seek a personal perspective is helpful in moving me from my head to my heart. Yes, Mary was certainly courageous. And today we heard in the gospel reading about the women who came to Jerusalem, following Jesus. Yet, somehow, we rarely focus on the strength of those women. What a loss of inspiration to all of us. I agree Alexandra! I wonder….did anyone hear a homily today that referenced the women in the gospel? Despite having done the Ignatian “thing” I will not seek to return to that scene as a “participant” nor to that of Jesus or Mary. And it is not only because of the pain – why did an adult sell two candles for a “knickle”; why were matches accessible to a four year old; why such a horrible abuse and injustice by men is love for me by His Father? It is enough that it was done, that I know, I don’t understand and I force myself to believe in the consequences. I cannot think of my Mary without the “incarnate” fact of the kind of person she was, still is and what she did, but to place myself in that scene, that place or that place of Mary at the brutal torture and execution of her son would be to live it. It is a bad place and one that should only be reflected upon from and through the lens of Resurrection, rebirth, healing and being healed, being done and over with. To do otherwise is wrong and can be dangeous and worst of all, to my mind, it is unchristian.